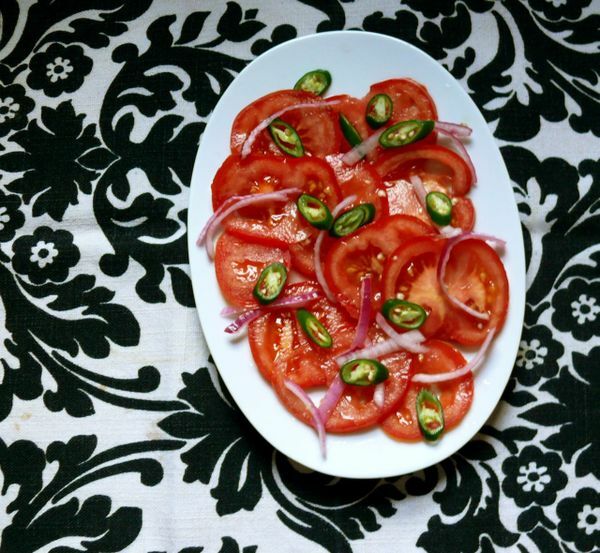 the thing about summer tomatoes is that you don’t really want to mess with them too much. they’re so delicious when they’re in season and ripe, that they can be enjoyed on their own, maybe with a flick of oil or chilies or salt. of course heirloom tomatoes are sort of life-changing, but the round, everyday, red beauties that are perhaps more plentiful and accessible, are nothing to ignore at this time of year. i pulled together some of my favourite recipes that feature ripe, red summer tomatoes and they’re perfect for these hot nights. the green chili and tomato salad (above) is meant to be eaten with rice! rice and curries, in fact. my mom makes an onion and chili salad to serve beside the spicy sri lankan food she makes, and she adds good tomatoes when she has them. it’s surprisingly cooling, even with slivers of green chilies, and a great contrast to those really rich foods. despite how delicious tomatoes are raw, i make a “pickled” tomato and fried basil pasta that calls for a little cooking and requires great tomatoes, since they’re one of only a few ingredients in this amazing sauce. it’s so simple and really, really good. it’s the only tomato sauce i eat in the summer. and of course, a panzanella salad, with crusty bread soaking up that tomato juice, is a classic summer dinner. that and a bottle of wine and your dinner party is practically planned. 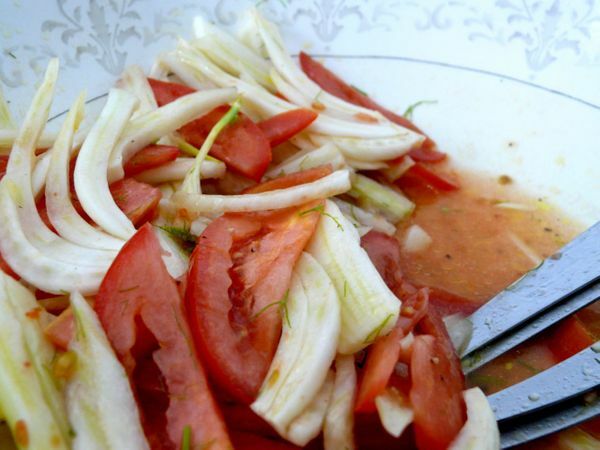 thin slices of fennel are my pick in this tomato and fennel salad (below), but it’s really up to you what you choose. peeled and sliced zucchini, peppers, beans or anything you see fresh at your market (or in your backyard!) would work just as well. all this is about, like the rest of the recipes above, is tomatoes dressed lightly, and enjoyed while we can.